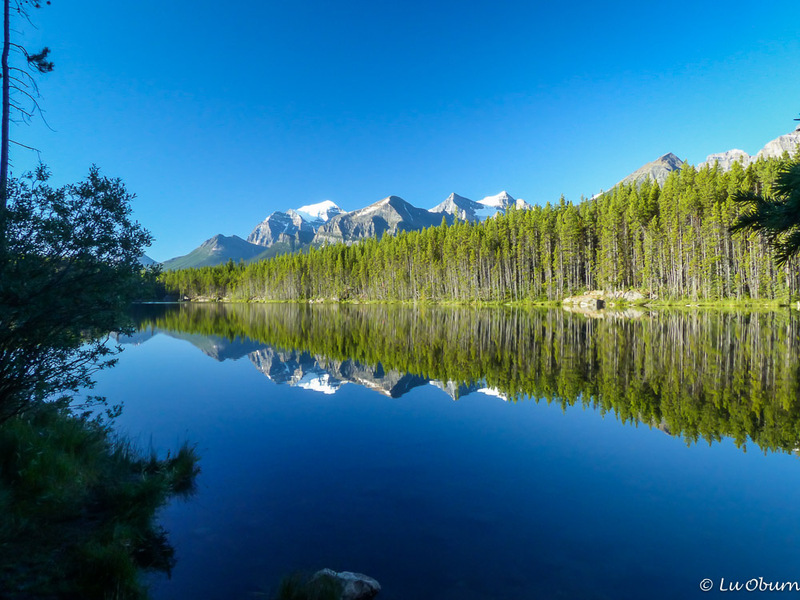 There is a dramatic stretch of highway that parallels the Continental Divide, melding together two stunning Canadian parks. This two-lane highway, stretching from the picturesque little village of Lake Louise in Banff National Park to the vibrant little town of Jasper in Jasper National Park, has been rated as one of the top drives in the world by Condé Nast Traveler, 144 miles of soaring rocky mountain peaks, ancient glacier ice fields, and immense sweeping valleys. I would not be classified a worldly traveler (more a wannabe) but I must agree that it is tops on my list. Herbert Lake, sitting under the peak of Mt. Tempe, was our first stop of the day after leaving Lake Louise. Its morning reflection was a great start to our day. Bow Glacier and Bow Falls , one of the many striking glaciers along this beautiful stretch of highway. Peyto Lake, named for “Wild Bill” Peyto, one of the first game wardens in the park. The unusually bright blue water of the lake, created by glacial “rock flour”, which scatters the blue-green rays of light, coupled with the wide view of the Mistaya Valley, make this one of the most scenic sights along the parkway. Another glacier seen from Hilda Pass. And another from the Sunwapta Pass. The Columbia Icefield, composed of eight glaciers and encompassing an area of about 200 miles, sits near the halfway mark on the Icefields Parkway. This ice mass is one of the largest south of the Arctic Circle and is one of the most reachable in North America. 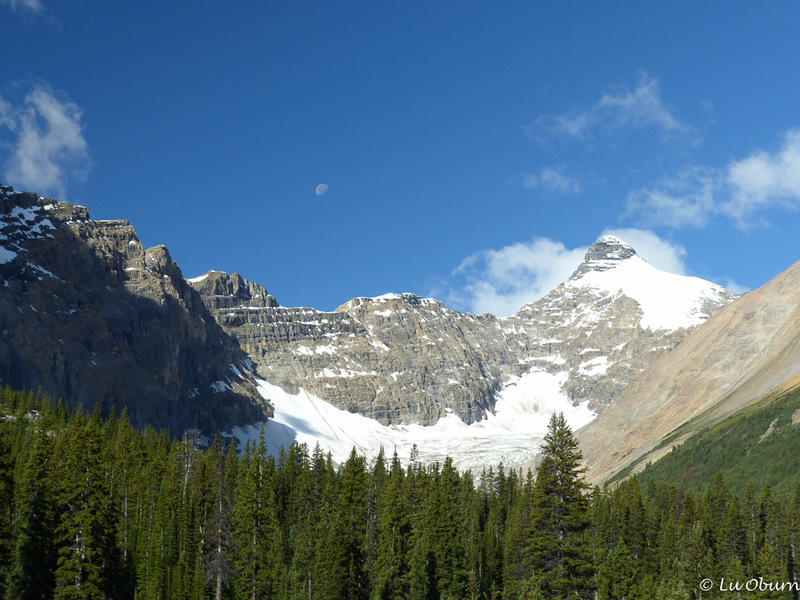 The Athabasca, Snowdome, and Stutfield Glaciers can be seen from the parkway. 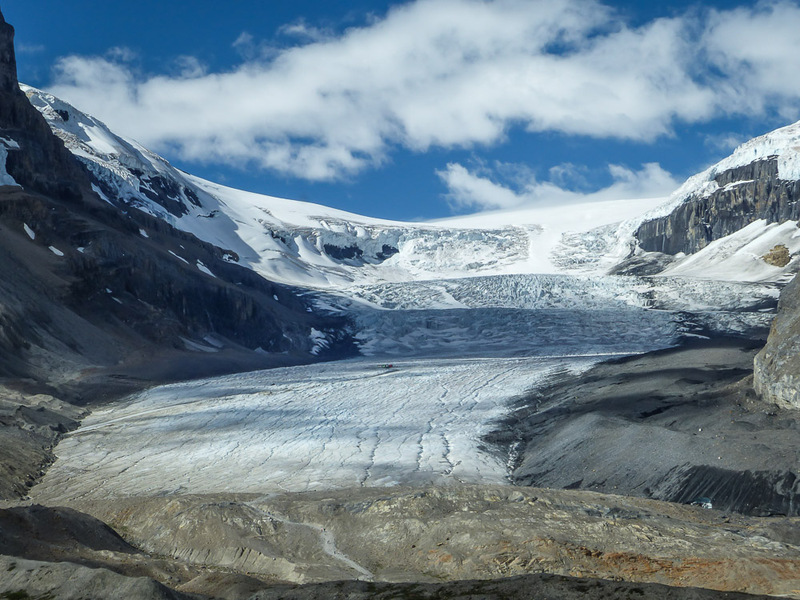 The Columbia Icefield Centre, much like a large National Park Visitor Center, is where you can book the Columbia Icefield Glacier Adventure, a 90-minute excursion onto the Athabasca Glacier aboard a massive Ice Explorer. Tours on the Glacier Skywalk, a glass-floored observation walkway 918 feet above the spectacular Sunwapta Valley, can also be booked at the center. Not unlike most other visitor centers, there is a 20-minute film that can be watched here. We experienced “Through Ice and Time”, the best film I have ever seen in a National Park visitor center. 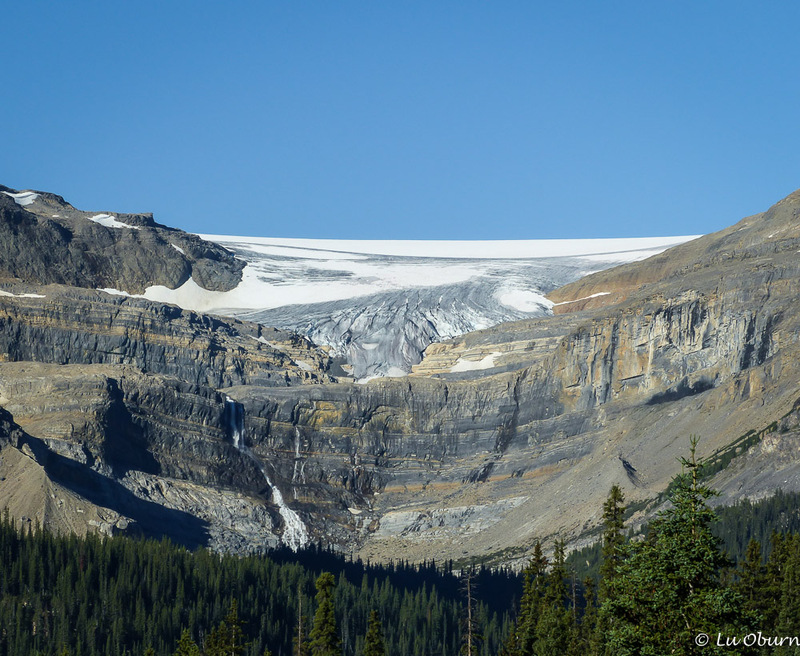 Snowdome Glacier, part of the Columbia Icefields. And the mother of them all, the Athabasca Glacier, largest in the Columbia Icefields, is the glacier the Ice Explorers drive visitors onto. In 1844 this massive glacier covered the area across the street at the Columbia Icefield Centre, where the parking lot now sits, another testament to how far these glaciers have retreated. 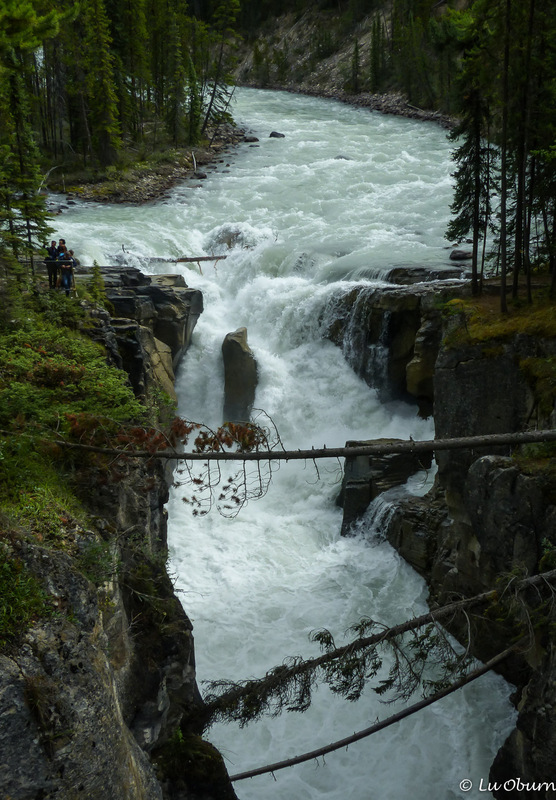 Thundering Sunwapta Falls, whose power can be felt and heard when you stand on the bridge above it. 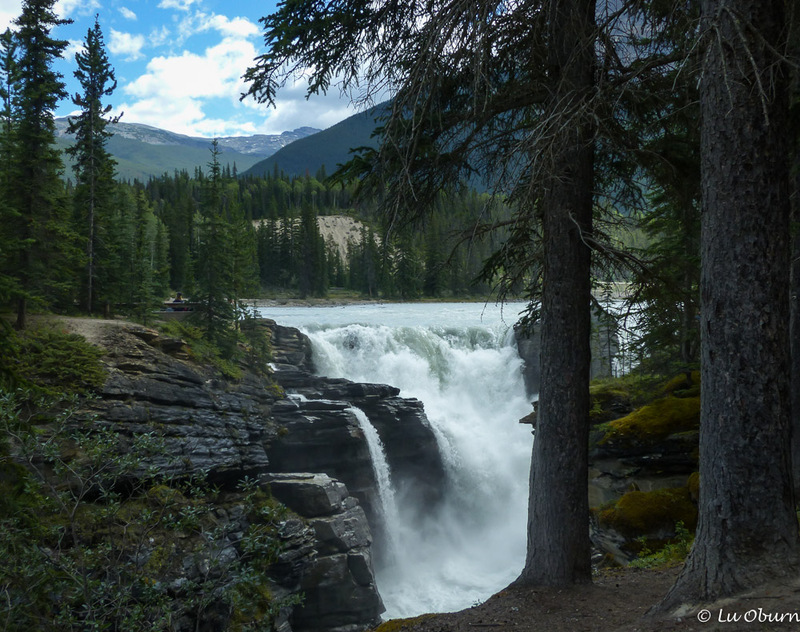 The massive power of the Athabasca Falls is created as the Athabasca River funnels into a narrow gorge. 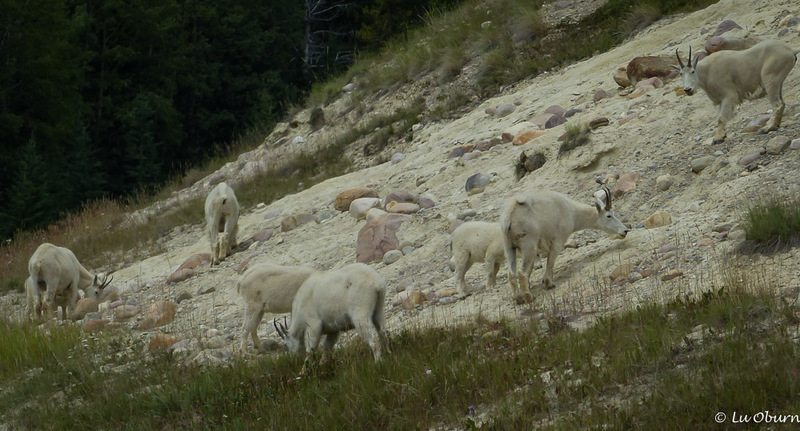 Mountain goats come down from the red cliffs of Mt. Kerkeslin to lick mineral deposits along the road. It is definitely one of the top drives we have ever been on. Love your beautiful photos. 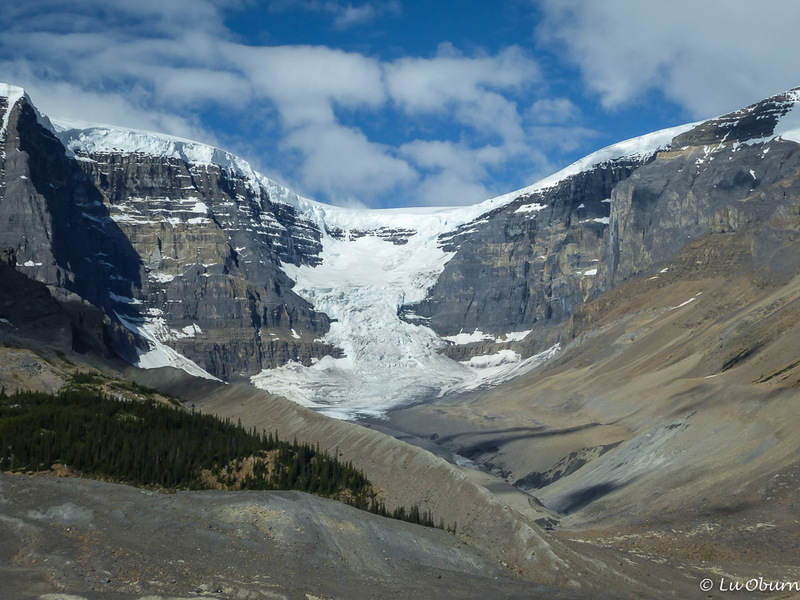 We drove over the Icefields Parkway in 2013 to join our Alaska RV Caravan and took the tour of the Althabasca Glacier. What a feeling to stay on 900 feet of ice that’s over a thousand years old! I would have loved to take a tour of the glacier. The lines were so long, with buses full of people waiting. Wow, LuAnn, you take such great pictures of these gorgeous places! I’Ve been traveling( flying) a lot in the last month and your pictures encourage my soul! Thanks! My pleasure Jan! Hope you and Kent are having a great summer. This looks like a bucket list item! Gorgeous photos Luann! It should definitely be on the bucket list Lisa. I agree, definitely one of the best drives I’ve taken. Fantastic photos! I just smiled my way through this post:) I loved everyone of these stops! Your reflection photos are spectacular!! We never got started early enough and there was always just a little breeze. 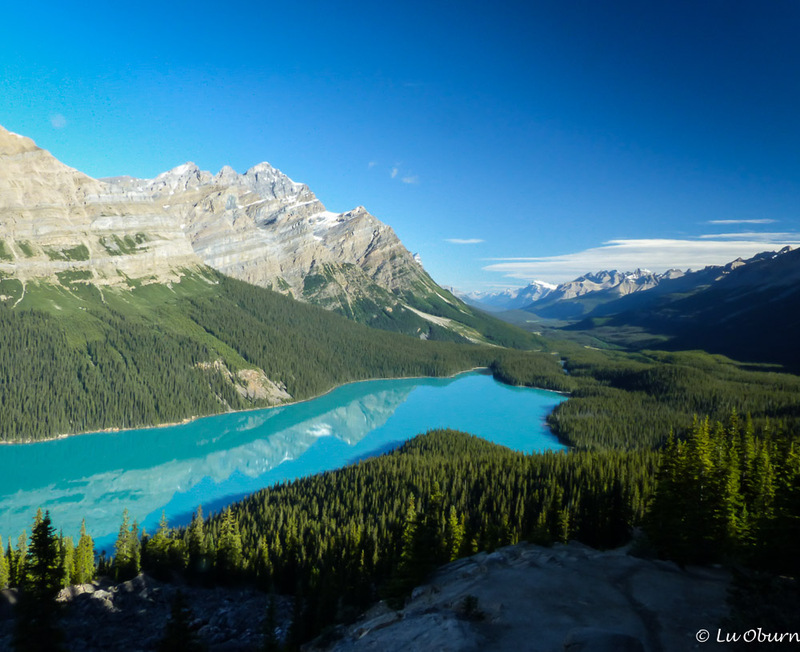 Peyto Lake is sooo pretty:) Did you keep hiking higher and get to the summit to overlook Bow Lake? This was an amazing view of Bow Lake and Bow Valley into the canyon. We had the whole area to ourselves!! 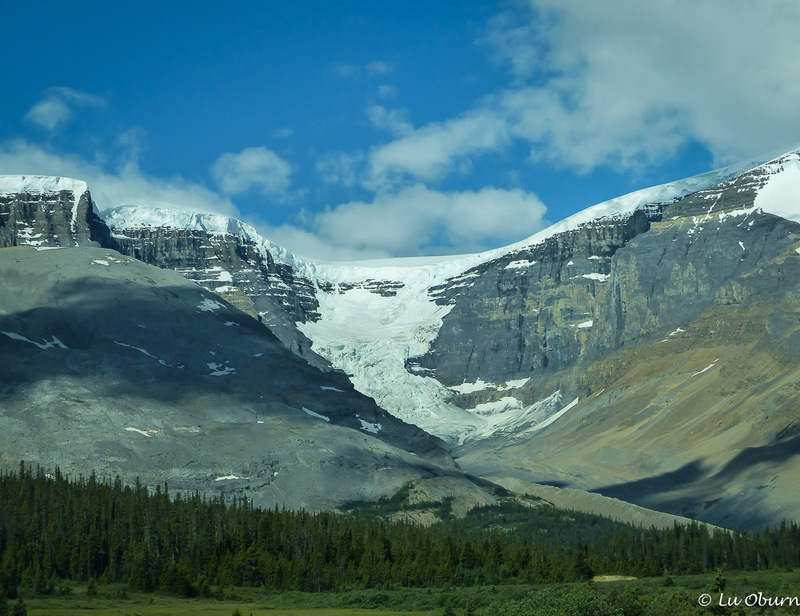 The Icefields Parkway certainly is something everyone needs to experience. We did hike up to get the view of Bow Lake and Bow Valley. Sadly I didn’t like my photos that I took while there. I do agree that everyone should experience this drive. Nature is indeed incredible, LuAnn. And your images are fantastic. The ‘blue’ of Peyto Lake caught me by surprise! I’ve never before seen anything quite like it. Canada certainly holds many surprises. I know I will travel there one day. Hopefully, I’ll get to enjoy a few of these sights. It would be such a shame to miss them. I have seen a lot of lakes that are fed by glaciers but nothing quite the color of Peyto Lake. Canada is an enchanting country with some amazing scenery. Your photos are breathtaking! The reflection photos are top notch! Such a beautiful planet we live upon! Thanks Nancy! We are so blessed to be able to see such fascinating landscapes. Wow, wow, wow. Just amazing. Our friends just drove that same stretch on their bikes. They said it was incredible. I love looking at those glaciers. Gigantic in size and beauty. It is spectacular country Marsha. Seeing it on bikes would be a wonderful experience. This is the most beautiful scenery I have ever seen. Glaciers, waterfalls and Herbert lake with the mirror image is the absolute best picture ever, the blue sky and the blue water… I could look at it all day! It is soooooooooooooooooo beautiful! Definitely on my bucket list, yes! I especially love the top photo with the reflections! Is this the area where you had hoped to camp? That would have been a wonderful place to be. Thank you for your great pictures and descriptions. Isn’t that reflection beautiful? There is no camping right there but not too many miles up the road are some nice camp sites. That drive looks absolutely gorgeous! Bet it would be one challenging bike ride. I cannot imagine riding that parkway on a bike. Perhaps the distraction of all the beautiful scenery would help. What a spectacular landscape! I can see why it’s rated as one of the top drives in the world. There’s something magical about the glacial lakes—love that you captured the reflections of the mountains in the turquoise water of Peyote Lake. The Glacier Skywalk sounds like it could be interesting, but also a bit unnerving. Did you consider it? Everywhere you turn there is another beautiful scene in front of you on this drive. I would love to do the Glacier Walkway but the crowds were crazy, bus load after bus load of visitors, and I don’t think many spoke English. Lots of international travelers at the parks this year. Thanks Sylvia. I feel so blessed to have the time to visit some amazing places. How gorgeous! We were supposed to be there last month, but alas everything changed. I’m even more motivated to go now. You and Paul would love this part of Canada Nina. I just wish we had had more time. I’m already trying to convince Terry to go back next year. Okay, Luann, you really got me sold with Canada. It’s going to be a life mission for me to go visit Canada. Incredible nature pics. I’m in awe! You will love it Rommel! LuAnn it looks as though you had glorious weather! Superb photography and your images transport me back immediately. Thank you for the kind words and link. Cycling the Parkway will always be a highlight for us. Although there is some big climbing involved the reward of these vistas and being able to stop at most any moment to savour the beauty makes it all worthwhile. A wonderful post my friend. Thanks Sue. It was the best day of weather that we had. When I saw some of the hills we drove, I was in awe of what you and Dave had accomplished. I do that when I am hiking a particularly strenuous trail. It really does make a difference. Spectacular and great photography. Cant wait for our turn! Will Betsy be able to negotiate the parkway? Thanks MonaLiza. I think Betsy would be able to negotiate the parkway, no problem. The parking lot at the Columbia Icefields Centre can be crowded but even then I don’t think that would be an issue. The only thing you might want to consider is whether you will be able to pull off the road onto the shoulder should you want to take a photo of something, like mountain goats. I’m sure that never happens though, does it? 😉 There are good shoulders on both sides of the road so that may not even be an issue for you. Absolutely jaw-droppingly gorgeous – You must have been in and out of your car snapping your stunning photos at every scenic overlook throughout your whole journey, LuAnn! We’ve driven through the Rockies in Montana, Wyoming and Colorado as well as the “Going to the Sun Road” but the Canadian Rockies may well have them bested! Thanks to you, we’ve added this drive to our Bucket List. Now we’ll just have to figure out when! Another beautiful place you have discovered!!! There just isn’t enough time in life, to see what God has created!!! There is not, but I’m trying! Simply spectacular LuAnn! Wow, I’m in awe at the beauty. Canada takes the Rockies to another level! How clean and unsullied it all looks. It is amazing how glaciers have shaped the landscape and worrying that they are receding. The Canadian Rockies are unlike anything I have ever seen…very pristine landscape! Thanks James! I am still using my Panasonic FZ200 bridge camera, and it gives me fits at times. I am probably a bigger critic of my photos than most. Oh wow, such great shots! On our travel bucket list for a long time and reading this post even more convinced to get there soon! Did our very first road trip on US soil this Summer discovering the southwest and have an appetite for more! Hope to be posting some photos of our trip soon, but am still in the sorting process, as we took over 5000 pics 😱😉 enjoy your day and travels! Thanks for stopping by Ingrid. I look forward to seeing your southwest photos, as I’ve lived in the southwest most of my adult life. Stunning photographs. Wow! Just spectacular. Incredible photos! I really cant wait to do this drive!